I have no need for the petty foot-based battles of filthy rebels and shiny Stormtroopers, adorable prequel droids and Order 66-awaiting clones. 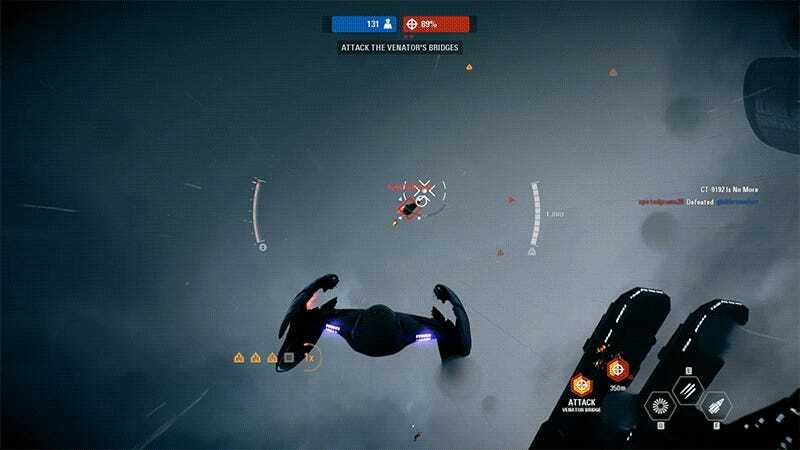 My star wars take place in the heavens of Battlefront II’s Starfighter Assault mode, so good it should be its own game. Star Wars has a history of producing very good games focused solely on space battles. The X-Wing series, Rogue Squadron, Starfighter—these are games that delivered the experience of participating in the starborne battles that set my young imagination on fire back in the ‘70s and early ‘80s. Battlefront II’s Starfighter Assault mode is part of a larger, mostly foot-based endeavor, but it feels like a standalone space combat game. It’s the sounds of the ships screaming through space, the “plut plut plut” of the lasers. It’s the sense of speed when the boosters kick in, the light and imagined heat of a narrowly-missed explosion. It’s the way the camera moves around the ships, as if everything’s moving so fast that whoever or whatever is filming it all is struggling to keep up. It’s Criterion Games, is what it is. The studio behind Burnout—no stranger to speed, funky cameras and explosions—got its hands on space combat this time around (Criterion did the speeder bikes in 2015’s Battlefront), and they did a bang-up job. It’s near-sensory perfection, or as perfect as flying an imaginary spaceship can get. Combined with outstanding maps that have players flying through massive Star Destroyers rather than just near them, dodging the scenery instead of admiring it, Starfighter Assault is one of the best arcade-style spaceship dogfighting games ever made. This is Heather playing, by the way. She gets the back pats. Only it’s not a game. It’s a mode in a larger game, one with some serious customer satisfaction issues. It could and should be so much more. Maybe next time!